not the obvious…. that he is one of the world’s most famous chefs, his impressive Michelin background, his restaurants are all 3 and 4 star ratings or the fact that they are world wide. It’s something more and once you have experienced it, you will know. We were left wanting to seek out additional Jean-Georges restaurants as we were in awe of………beautifully displayed food, fresh concepts, unique menu, exotic flavors of the East and impeccable service. A little about Jean-Georges Vongerichten ~ a French chef born in Alsace, France, March 16, 1957. Currently, he resides in New York City where he has ten restaurants. Vongerichten opens restaurants in most of the culinary capitals such as Las Vegas, London, Paris and Shanghai, as well as New York. He is author of five cookbooks, two with Mark Bittman. When Jean-Georges was 16, his parents brought him to the 3-star Michelin-rated Auberge de l’ill for a birthday dinner and that is where his love for food began. What make Jean-Georges unique? 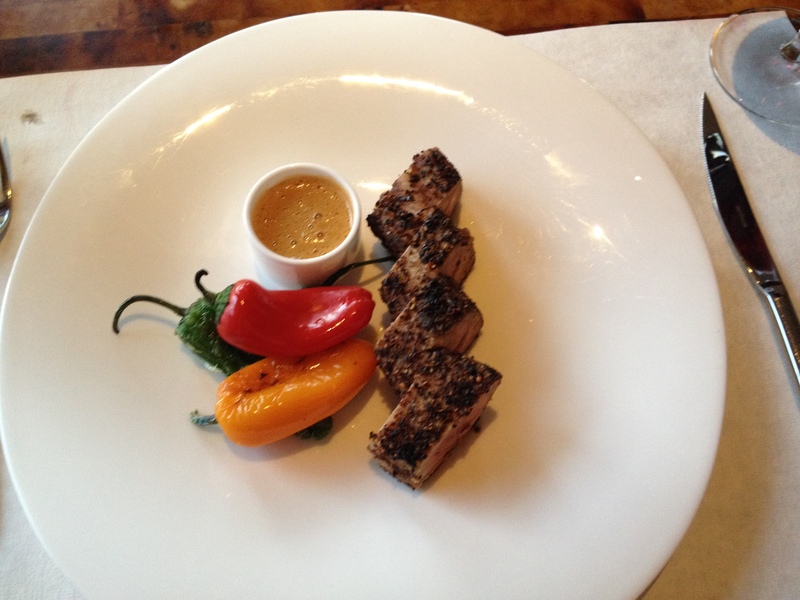 His signature cuisine eliminates the traditional use of meat stocks and creams. Instead, he features the intense flavors and textures from vegetable juices, fruit essences, light broths, and herbal vinaigrettes. Jean-Georges’ culinary concept has redefined industry standards and radically changed the way we eat. Jean-Georges and Starwood Hotels: Vongerichten and partner Phil Suarez have formed a new company with Starwood Hotels & Resorts Worldwide Inc. and Catterton Partners, a consumer-focused private-equity firm which owns, operates, manages and license restaurants in Starwood properties. This new venture includes seven Spice Markets and other concepts world wide. The total number of eating destinations may possibly total 56 with this contract. The first to open were two Spice Markets at the W Hotel in both Atlanta and Istanbul. Accolades: Jean Georges has received the James Beard award for Best Chef and Best New Restaurant. Esquire Magazine voted Chef Vongerichten the Chef of the Year in 1997. Jean Georges restaurant holds 3 Michelin stars. In 2008 it received a 18/20 “Excellent” rating. 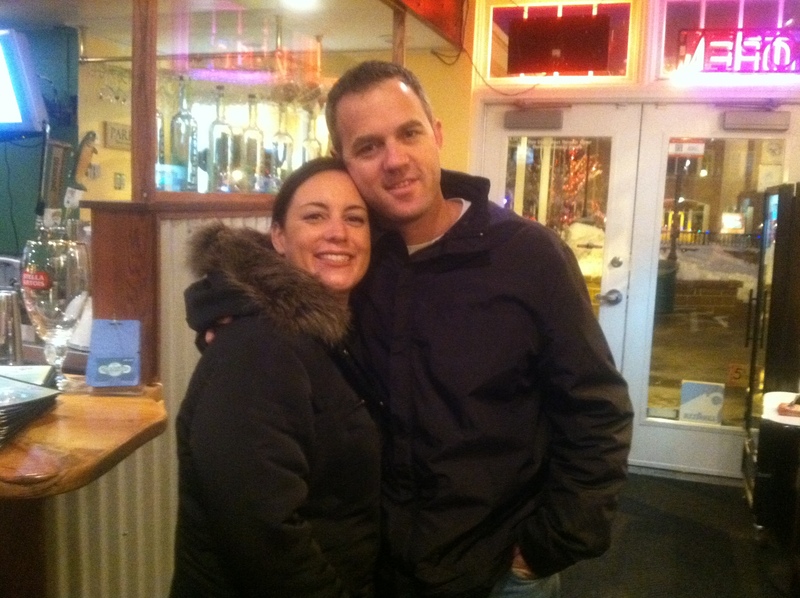 In 2009 it won the James Beard Foundation Award for outstanding restaurant. In 2007, Lia Bardeen, Jean Georges executive sous chef, was featured as a contestant on season 3 of Top Chef. In 2010, Jean Georges won the James Beard Award for “Outstanding Wine Service”. In 2013, Zagat’s gave it a food rating of 28, the second-highest in the West 60s, and rated it the 6th-best restaurant in New York City. 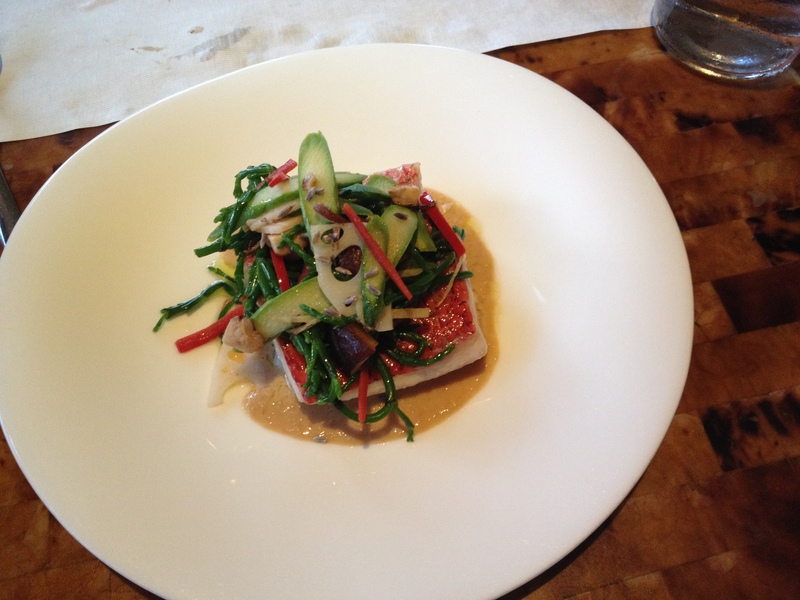 Jean-Georges Vongerichten’s Kauai Grill opened in 2009 which is located in Kauai at the St. Regis Princeville. 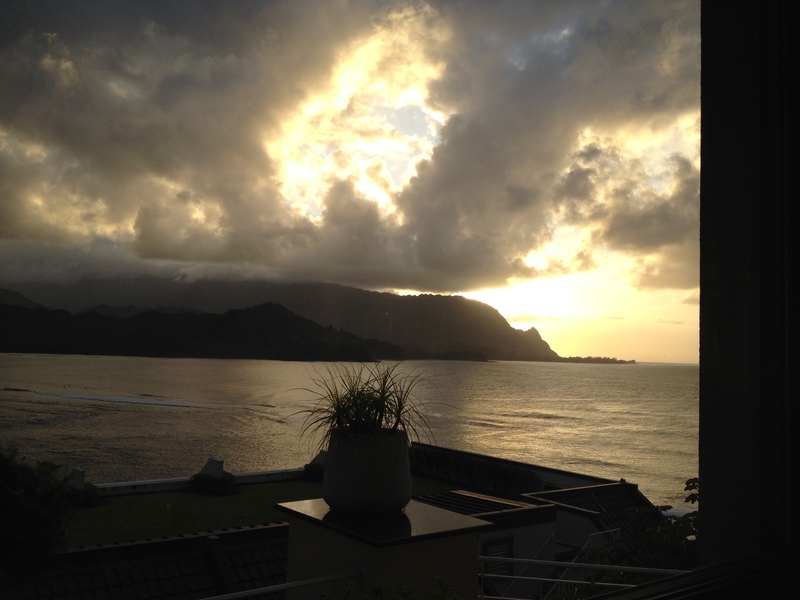 Throughout the restaurant there are large windows displaying breathtaking views of Bali Hai and Hanalei Bay. A hand crafted fiber optic and ruby glass hibiscus chandelier hangs from the center of the ceiling and zebra woods are throughout. felt engaged in the process. 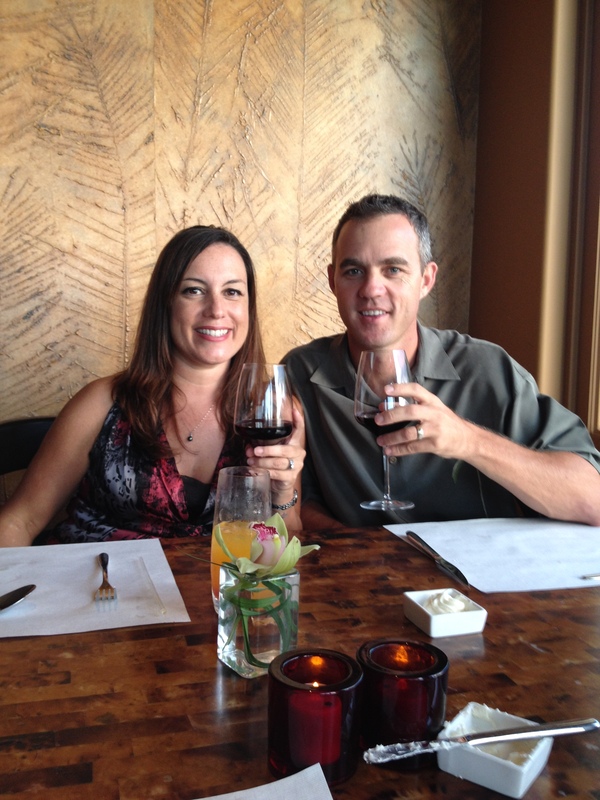 The waiter recommended several appetizers, wine, entrees and dessert. 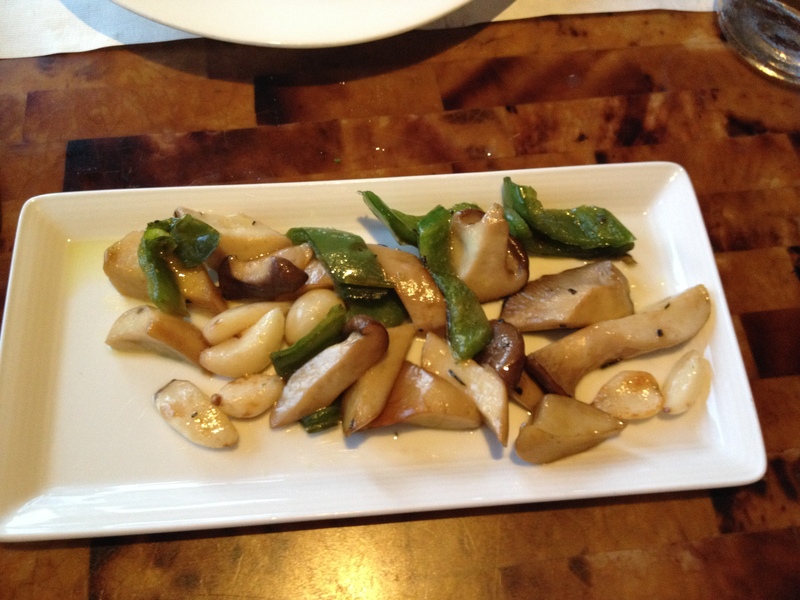 We were pleased that our favorite appetizer, the Grilled Black Pepper Octopus, remained on the menu. 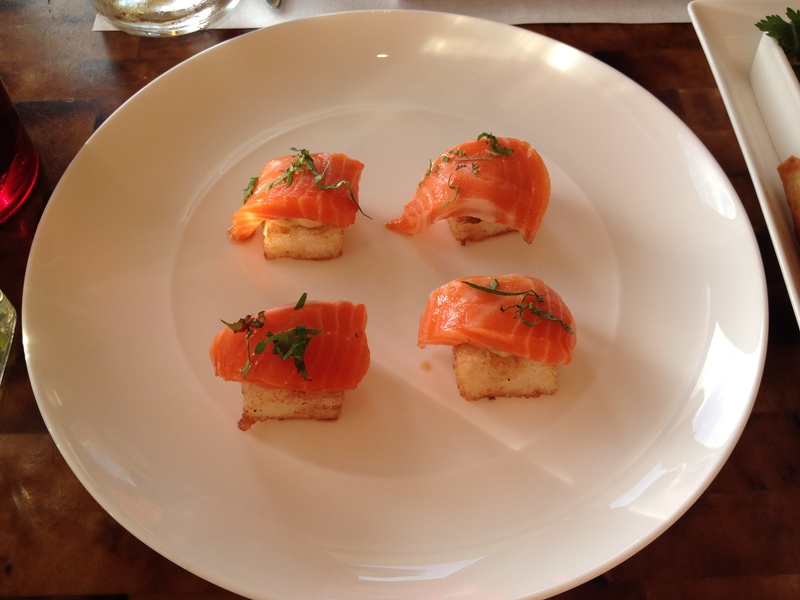 The waiter recommended the Salmon Sashimi with Warm Crispy Rice which melted in our mouths. waiter was at our table instantly with alternate recommendations. The waiter checked in with us each time food was brought to the table. 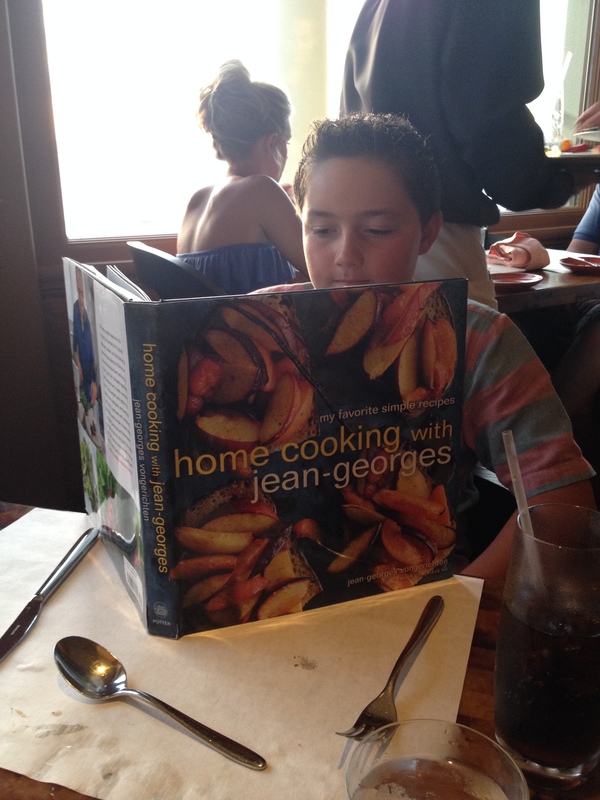 When our son expressed his love for cooking and the waiter brought two Jean-Georges cookbooks table side for him to look through while he was awaiting the entrée. For the highlight of the evening, the chef took him on a tour of the kitchen!! The overall experience could not have been any more magnificent. 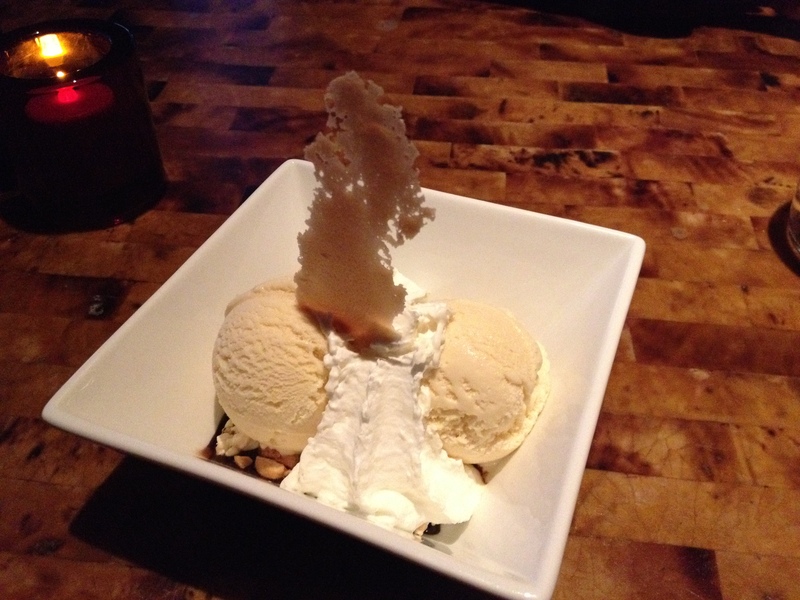 We ended the evening with the waiter’s recommendation for dessert….. Salted Caramel Ice Cream Sundae. 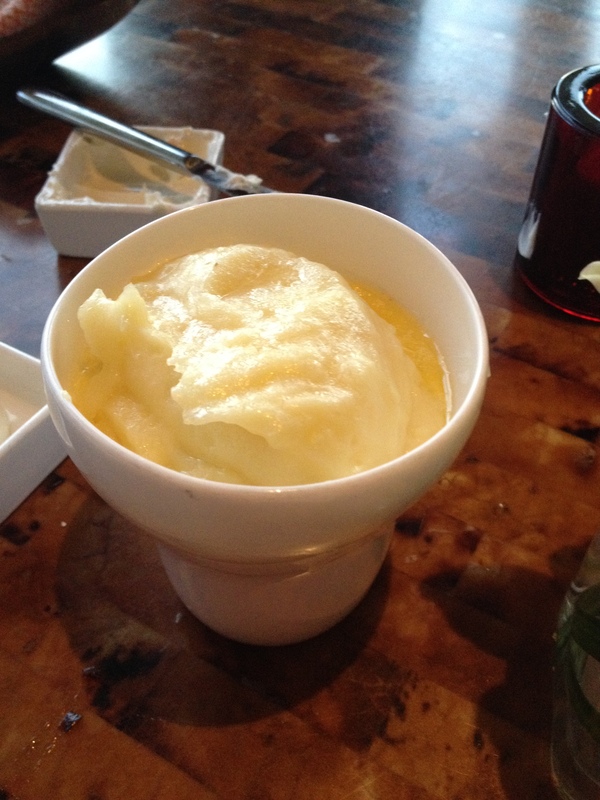 The ice cream is made daily at Kauai Grill! Jean-Georges restaurants offer kids menus. 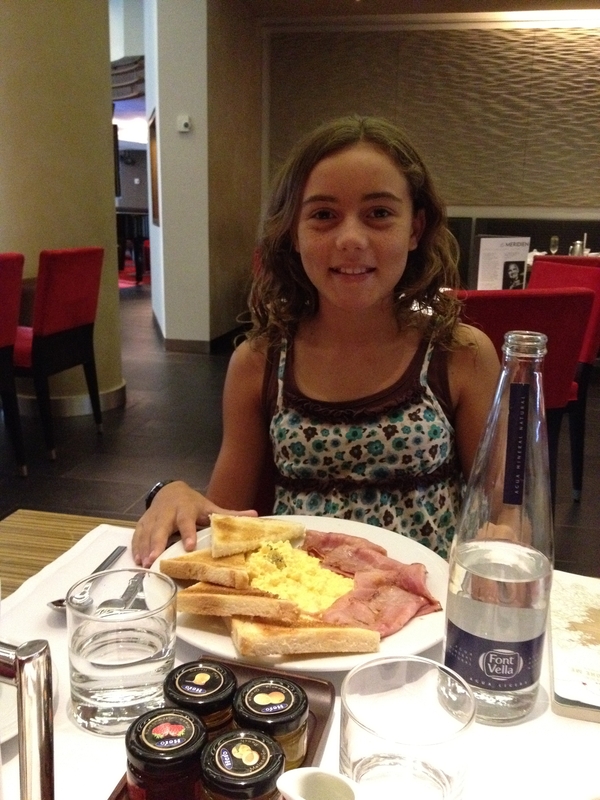 Many of the entrées on the kids menu were the same as the adult menu, offering smaller portions. The kids menu even had a burger and fries option. J&G Grill is the Jean-Georges restaurant located within the St. Regis Deer Valley Resort in Utah. The restaurant is decorated with dark woods, stone and fireplaces throughout. The resort has a high-end lodge ambiance throughout with floor to ceiling glass windows where you can watch the snow fall. After a long, cold day or skiing or just simply playing in the snow, it is wonderful to sit down to a nice, hot meal at J&G Grill. 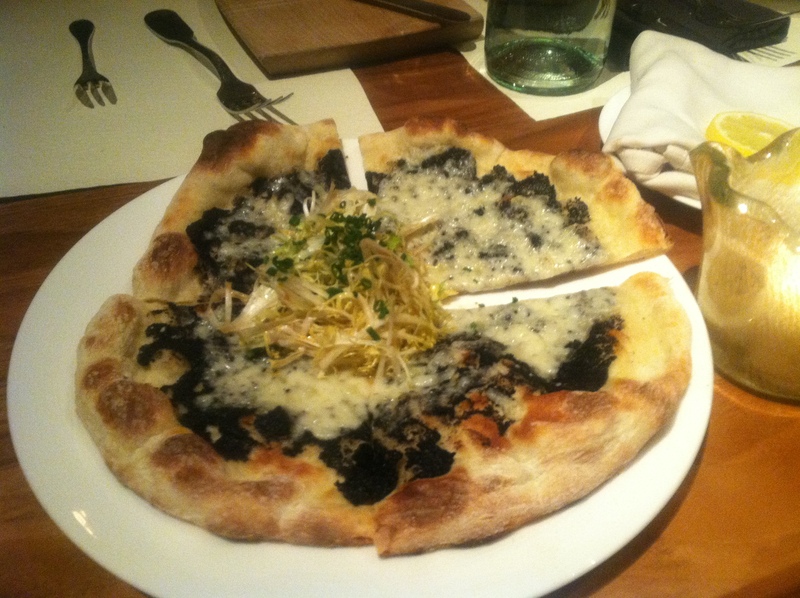 To start off, we have to describe the Black Truffle Pizza with Fontina Cheese. This pizza is possibly the best we have ever had. The kids asked what was on the pizza and we said we didn’t know (thinking they wouldn’t eat it if they knew it were truffles) and it was gone. It was outstanding so we ordered a second pizza. 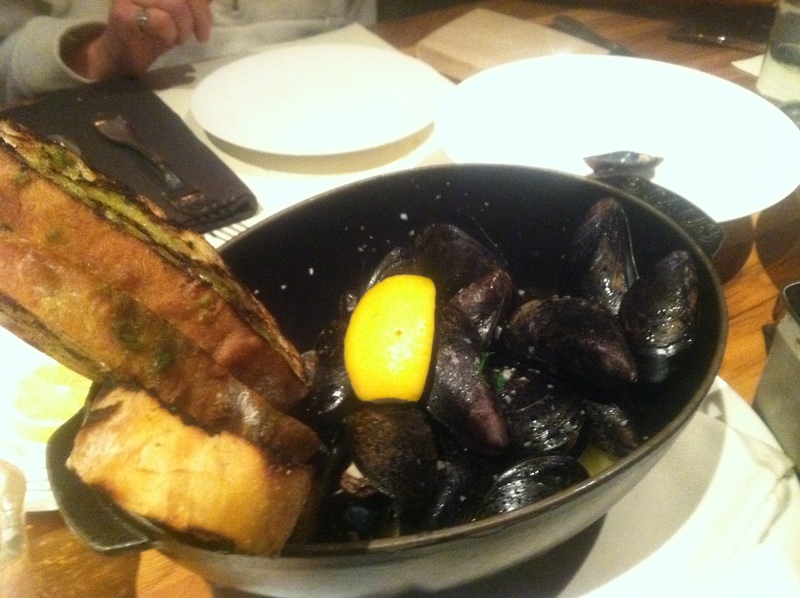 Next, we ordered the Maine Mussels Mariniere with Grilled Garlic Toast. The picture tells it all. 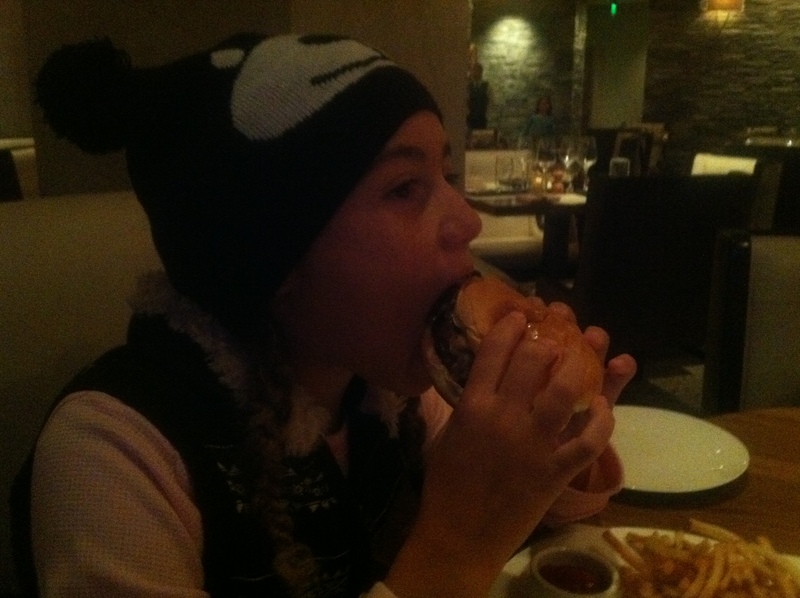 Again, Jean-Georges offered a kids menu and our daughter chose a simple burger after skiing all day. It is refreshing to find a fine dining restaurant which not only offers a kids menu, but one which includes a burger option on the menu. J&G Grill offers simply grilled preparations of the highest-quality meats and freshest local fish, accompanied by bold condiments. 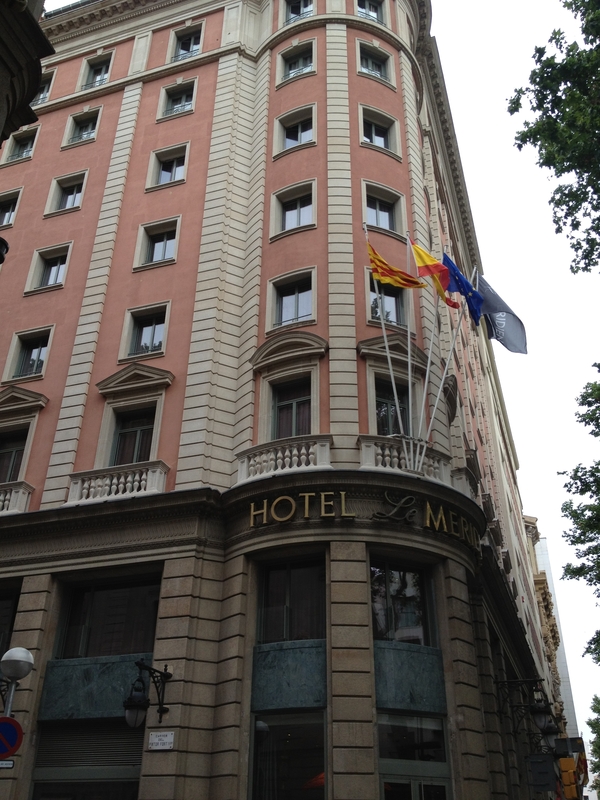 In 2009, Le Meridien Barcelona began offering new elements created by chef Jean-Georges Vongerichten. Jean Georges Elements. The breakfast innovator has created 7 “Eye Openers”, juice tasting and 6 dishes, some of which can be found in the buffet and some on the menu. Dishes invented internally. Le Méridien organised the competition “Sabor a Descubrimiento” (Discovering Flavours) which challenged the chefs from all the chain’s hotels to send original recipes that gave new perspectives on pastries, sweets and sandwiches for breakfast. 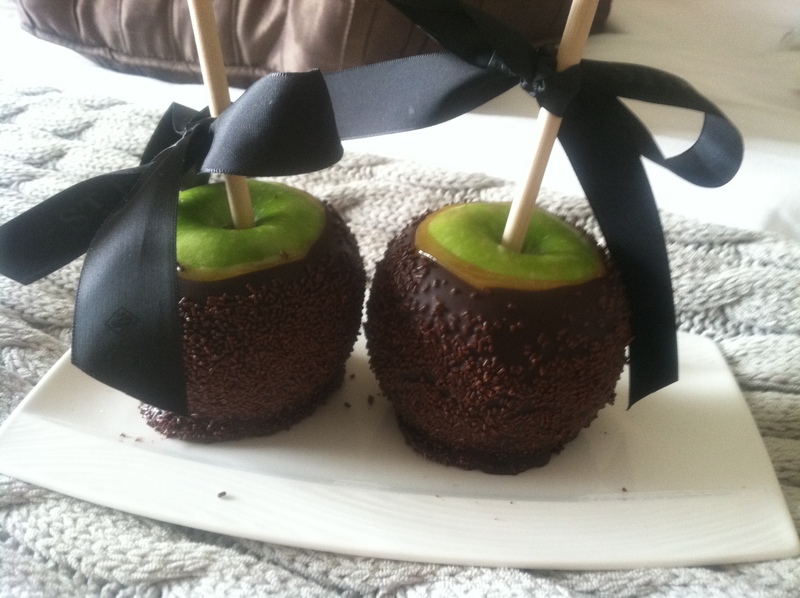 The prize for the winners was recognition for their recipes by including them in the Le Méridien Breakfast. International Menus. 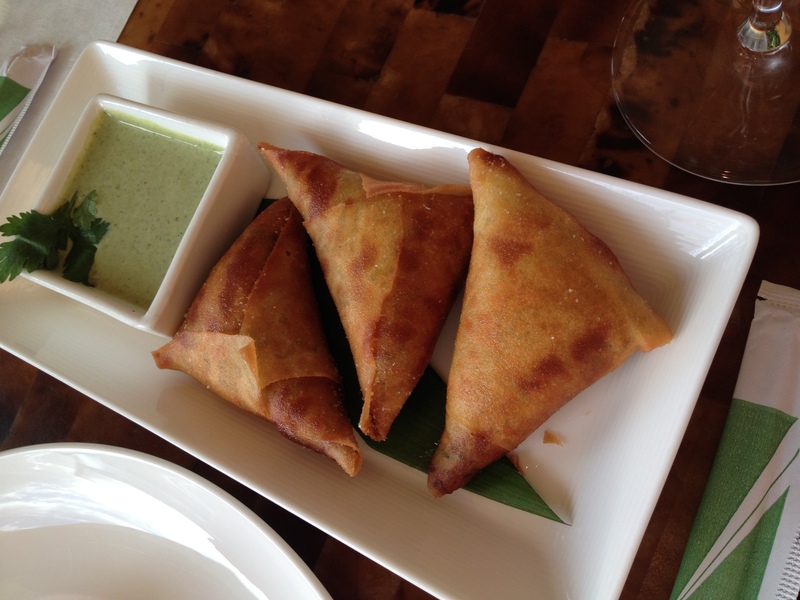 There is a selection of menus fromChina,Japan,India and theMiddle East. IllyCaffé. The intense experience of sampling one of the world’s best coffees, both in the lobby and at breakfast. Uniforms. The chefs wear a uniform according to the Breakfast. down to the lobby at the Le Meridien Barcelona and smelled the wonderful meats and cheeses. After grabbing our cappuccino, we headed straight for the Breakfast with Jean-Georges. 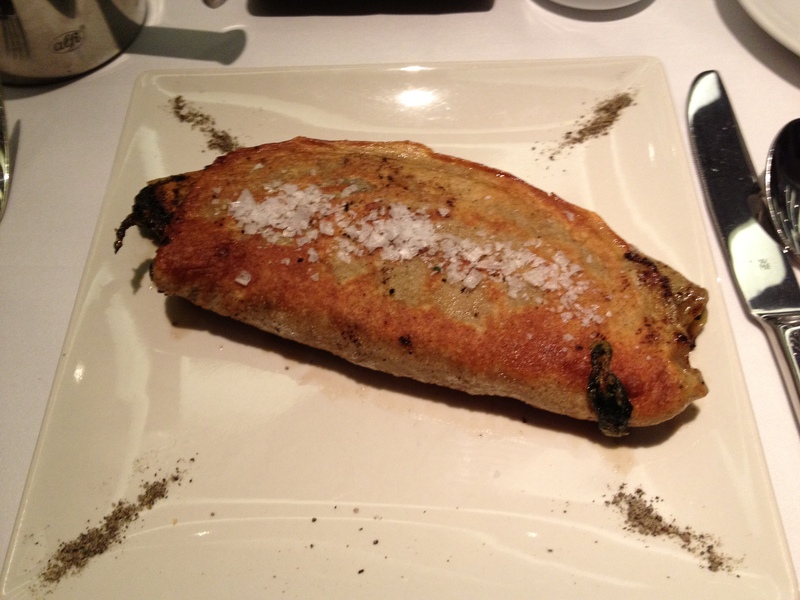 Our daughter loved the cured meats with eggs and toast while we opted for the buckwheat spinach calzone with sea salt. Jean-Georges breakfast offers an array of fresh squeezed juices in a rainbow of colors. “My goal for Le Meridien was to create a breakfast experience that not only delivers the basics at a high quality level, but also provides a level of ‘discovery’ for guests by blending exotic flavors with everyday ingredients. 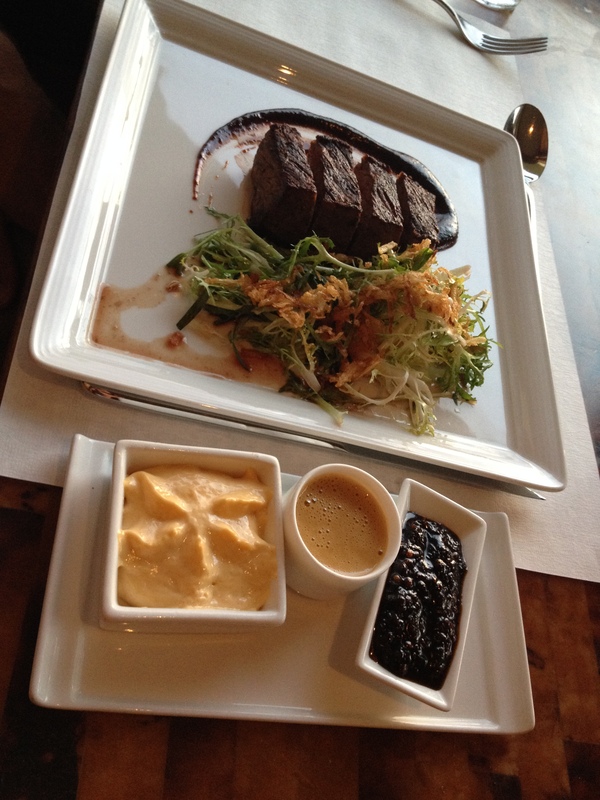 The dishes deliver a unique blend of flavors that invigorate and awaken the palate,” added Jean-Georges Vongerichten. Living on Kauai, our kids don’t have any exposure to skiing, snow or a winter for that matter. 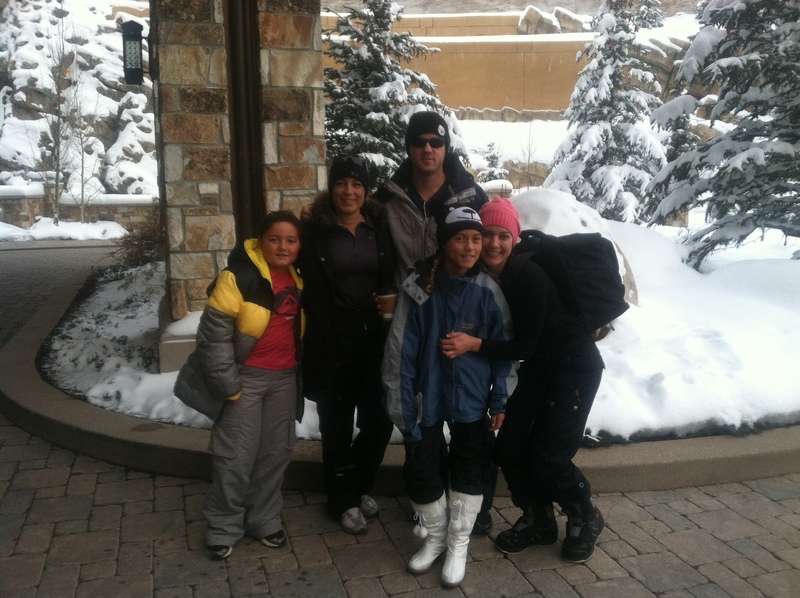 After researching several places to ski, we chose Deer Valley, UT. Deer Valley sits above Park City and is about 40 miles from the Salt Lake City airport. 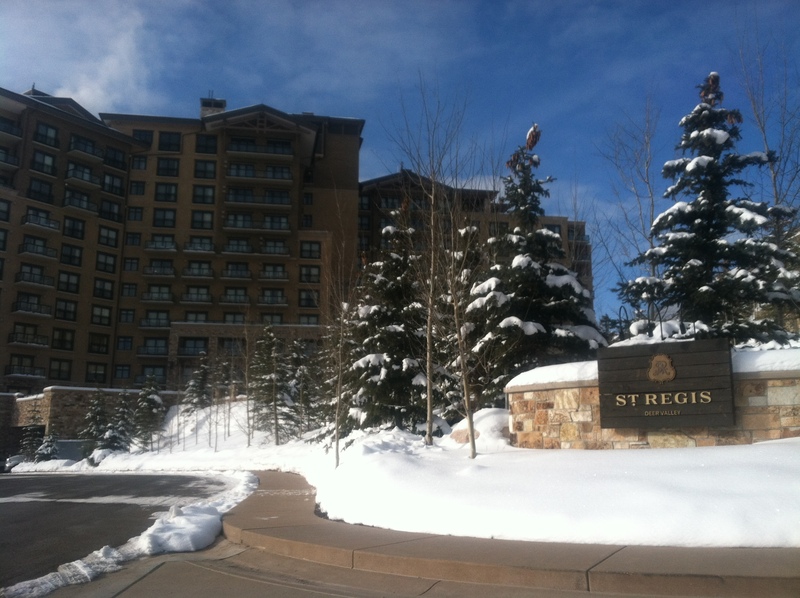 Rent a car and enjoy a beautiful view on your drive to Deer Valley. 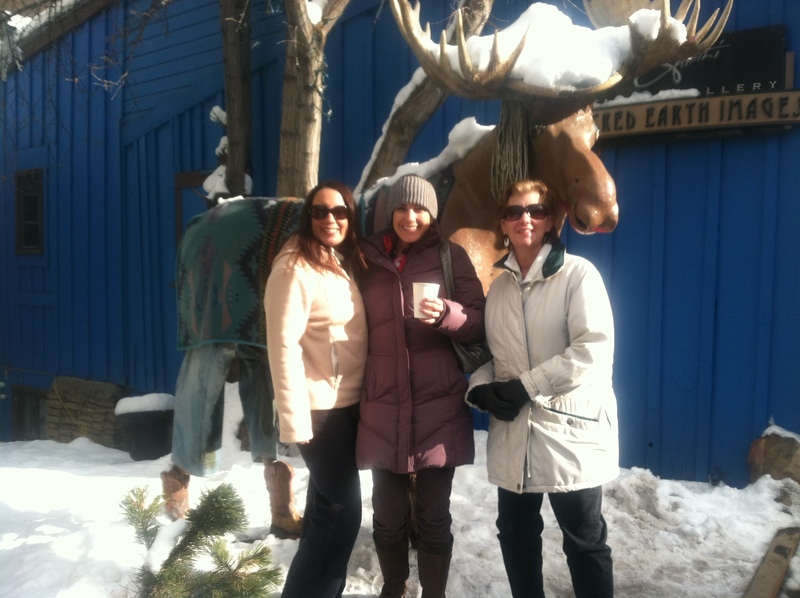 We stopped in Park City to grab lunch prior to checking into the hotel. 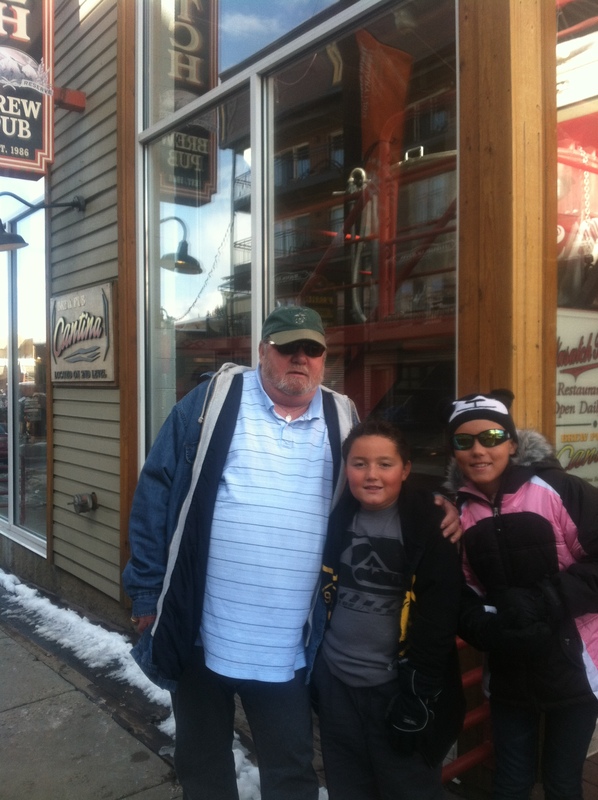 We were pleased to find little shops and restaurants on Main Street as you go through the town of Park City. 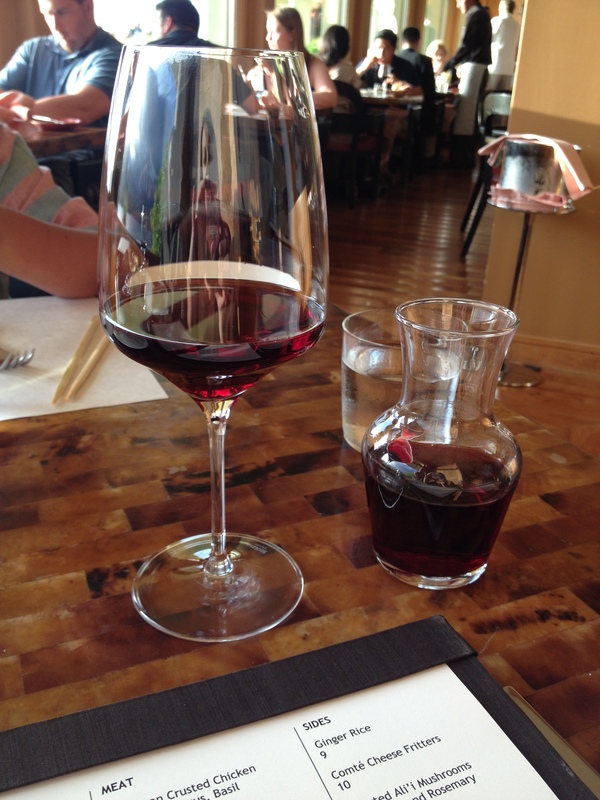 We found a great wine shop and picked up various types of wine to bring to the hotel. 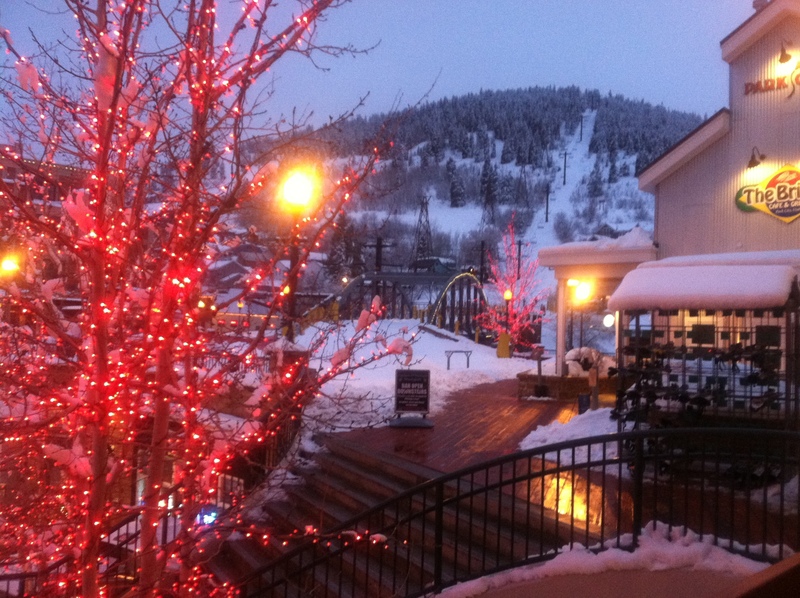 Park City looks like a Thomas Kincaid painting. Park City is a city located in Summit County, UT. The city is 32 miles southeast of downtown Salt Lake City and 19.88 miles from Salt Lake City’s east edge of Sugar House along Interstate 80. In 2010 the population was 7,558. It is a very touristy area – where the visitors outnumber the residents – much like Kauai where we live. Mountain Resort. The Park City and Deer Valley ski resorts were the main locations for events at the 2002 Winter Olympics. 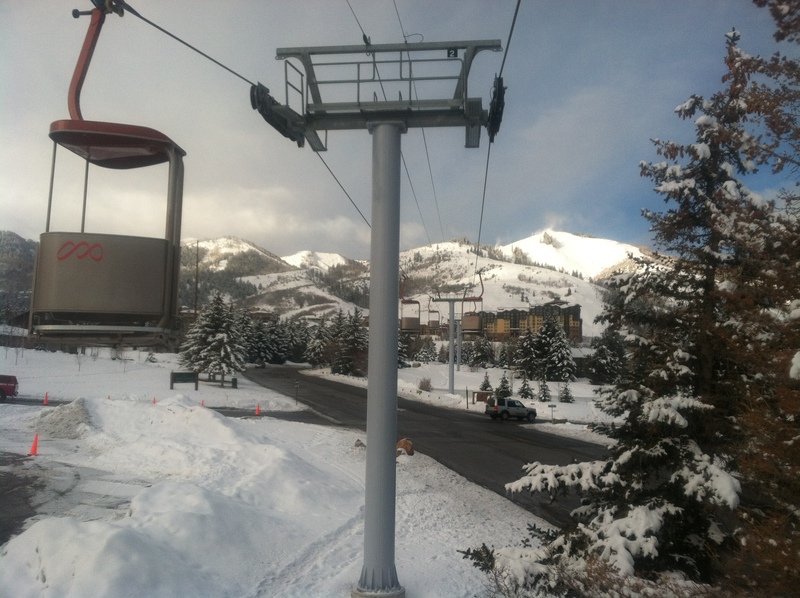 Park City is the location of the United States’ largest independent film festival, the Sundance Film Festival. It is also home of the United States Ski Team and training center for members of the Australian Freestyle Ski Team. Park City has the largest collection of factory outlet stores in northern Utah, the 2002 Olympic bobsled/skeleton/luge track at the Utah Olympic Park, and golf courses. 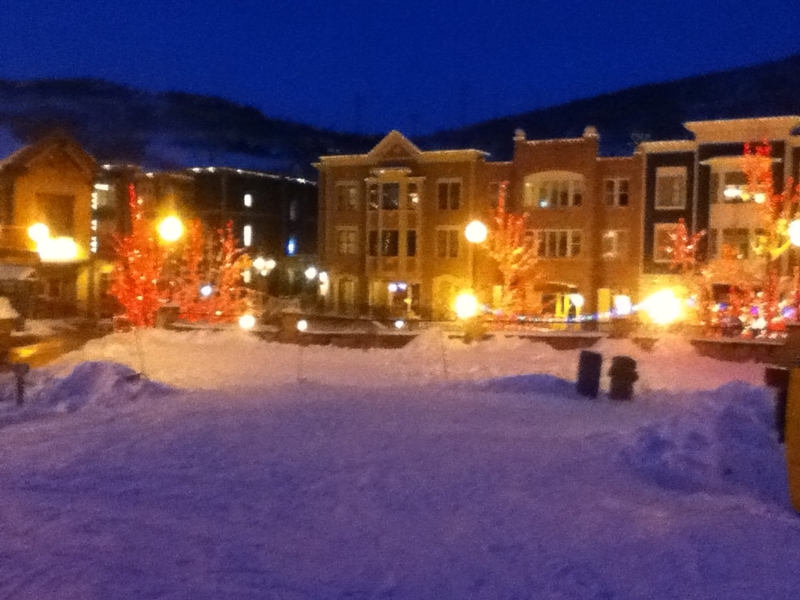 There have also been movies filmed in Park City- for example some of the scenes from 1994’s Dumb and Dumber. 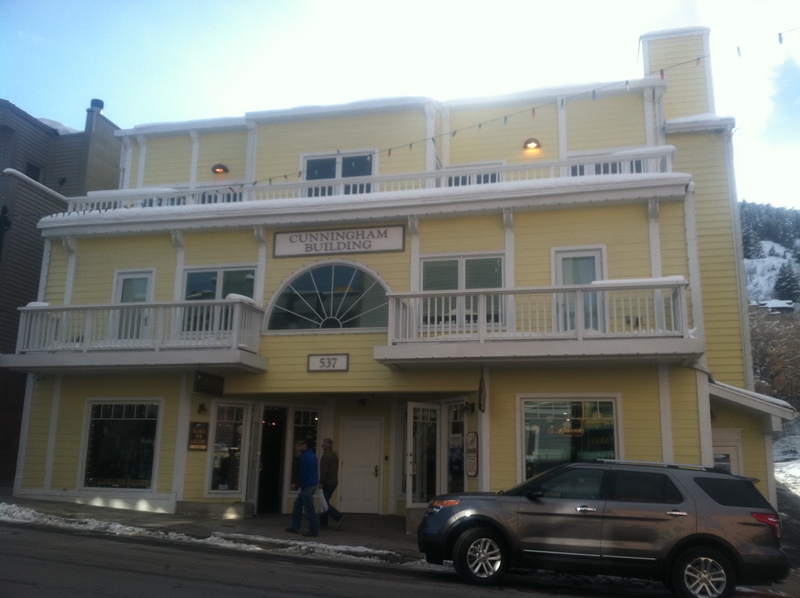 Outdoor-oriented businesses such as backcountry.com, Rossignol USA, and Skullcandy have their headquarters in Park City. The city has many upscale luxury retailers, clubs, bars, and restaurants, and has nearby reservoirs, hot springs, forests, and hiking and biking trails. Most importantly in my book – Park City is also the original home of the Mrs. Fields Cookies chain!!!! 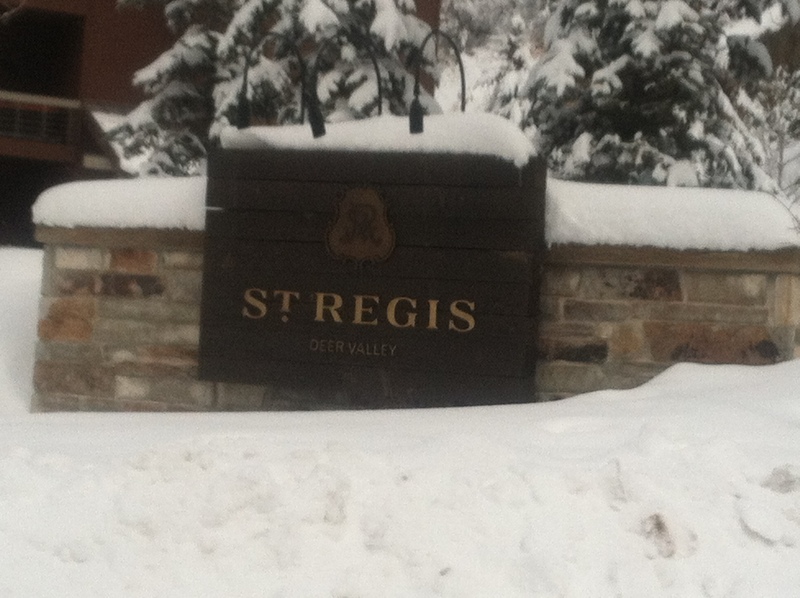 The St. Regis Deer Valley is a very family friendly hotel offering several activities which are complimentary. Prior to check in, we stepped into a funicular which took us up to the hotel entrance. The view from the funicular was breathtaking. Our kids enjoyed a hot apple cider and hot chocolate bar from 3-5 p.m. daily. After skiing in 16 degree weather, it was a great way to relax and read a book in the large living room or recap on our day of skiing. The hotel offers s’mores each evening in an outdoor patio setting with a fire pit. A silver cart rolls out and the kids can assemble all of their own s’mores. During the day the activities included playing pool and video games in a game room, swimming in an outdoor heated pool amidst snow, and gingerbread house decorating. The view from our room was filled with pine trees which were lit up in different colored lights. The room was cozy with a fireplace inside. 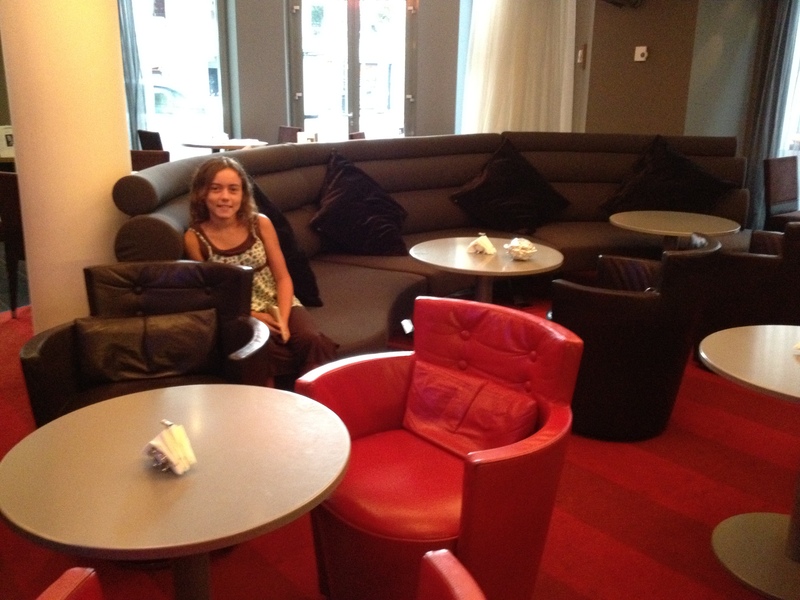 The lobby is a cabin feel, which is very cozy but upscale at the same time. The lobby has floor to ceiling glass where you can view the snow falling while sitting next to a fire place. One very convenient perk is the house car that takes guests to Main Street and back so you don’t have to drive down the hill to Park City in the snow. yurts to relax in. The kids had a blast as I video taped them flying down the lanes. 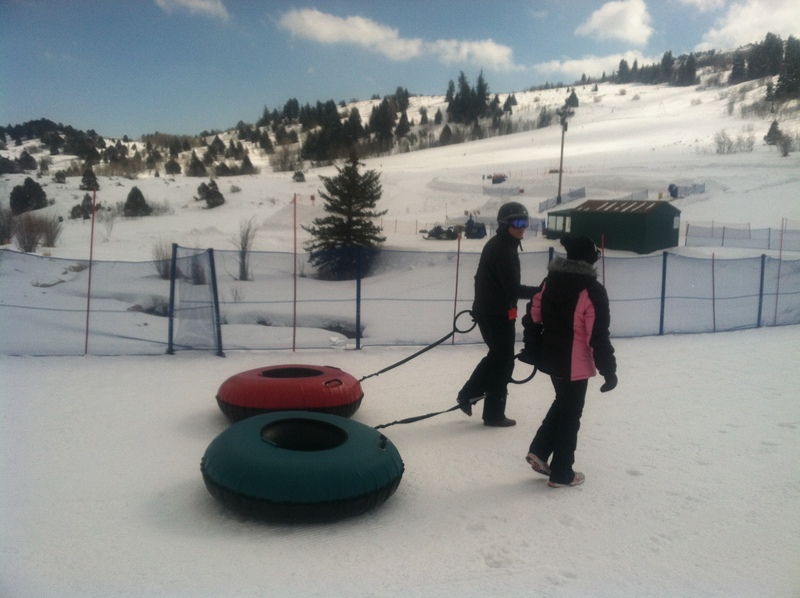 The park has a lift to carry the rider and tube up the hill. Snow Mobile information: There are pint-sized snowmobiles for the little ones to ride around in a loop again and again. Available for kids aged 5 to 12 who would just love to rev up and zoom around their groomed track. 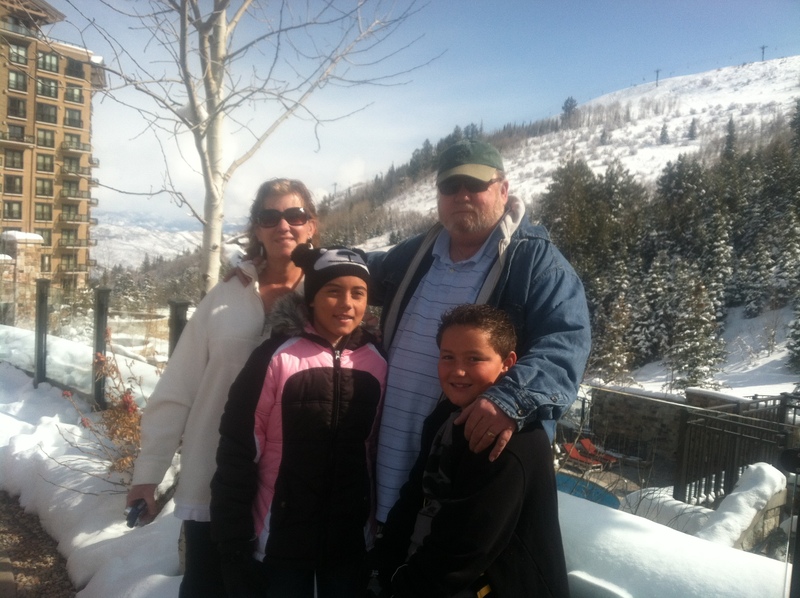 Our son wanted to snow board, which is not permitted at Deer Valley ski resort. 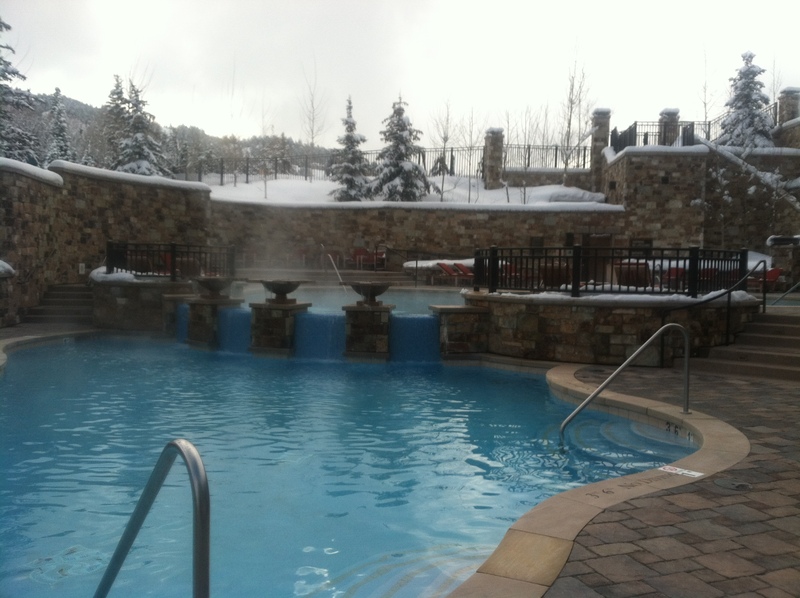 We researched different places nearby and Canyons Ski Resort seemed to be the most family friendly and cost effective. 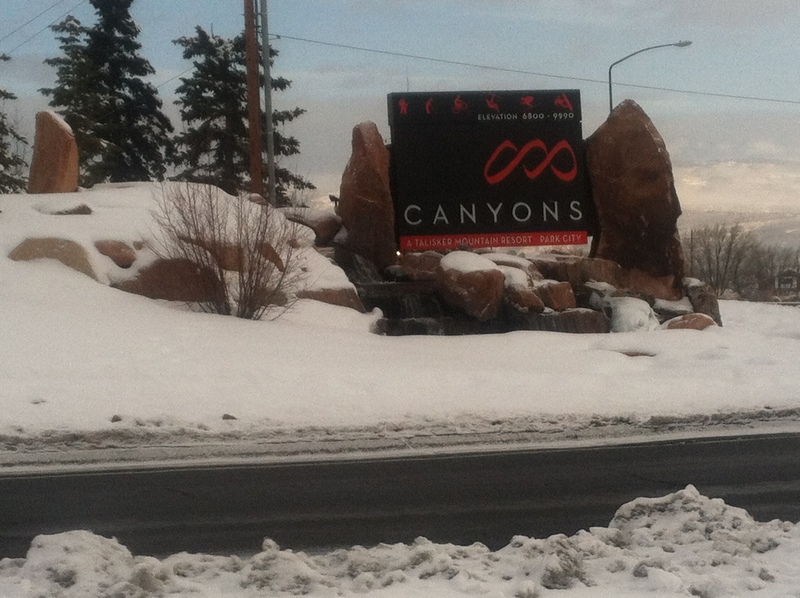 Canyons offers ski lessons in a group or one on one, they have a lodge to eat lunch, rental shop for equipment and shops that sell ski gear. $$ saving tips: If you plan to ski several days in the Park City, stop off at Costco and check out their ski lift ticket booklet. We went to Costco in Salt Lake and they had a special, if you purchased a camelback (backpack with water spout for exercising) then a ski lift booklet for multiple resorts came with it for $50. Be sure to bring your own ski pants, jacket, hat and googles to Gorgoza Park so that you don’t have to purchase equipment there. 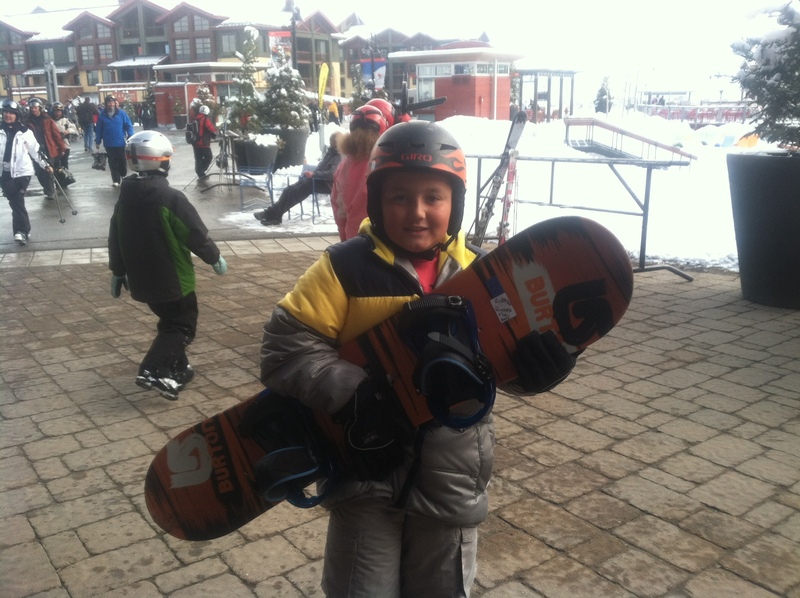 We chose a group ski/snow boarding lesson for the kids at Canyons Ski Resort. No one else showed up to the lesson and as a result our kids ended up with a private lesson for the cost of a group lesson. While there are no guarantees, it is a significant price difference. We went to Canyons during the peak season. Our first time skiers were on the chair lift in under an hour. The lesson includes lunch for the kids and they do not allow the parents to be with the kids during the lesson or lunch. There is a pick up and drop off time.